The Katy Texas Real Estate Blog | 100% of the Time, It's Not the House or Home You Buy, It's the Realtor You Choose! 100% of the Time, It's Not the House or Home You Buy, It's the Realtor You Choose! HOUSTON — (December 10, 2014) — Homes appear to be high on holiday shopping lists as consumers continued to snap up properties in November, pushing prices up once again while driving the supply level down. The majority of the month’s sales activity took place among homes priced between $250,000 and the millions. According to the latest monthly report prepared by the Houston Association of Realtors (HAR), single-family home sales totaled 5,092 units, an increase of 1.8 percent compared to November 2013. Months of inventory, the estimated time it would take to deplete the current active housing inventory based on the previous 12 months of sales, dipped to a 2.7-months supply versus a 2.9-months supply last November. That is markedly lower than the current national supply of 5.1 months of inventory. Home prices achieved record highs for a November. The average price of a single-family home jumped 10.3 percent year-over-year to $271,232. The median price—the figure at which half the homes sold for more and half for less—rose 6.7 percent to $194,800. November sales of all property types totaled 6,212 units, a 2.8-percent increase compared to the same month last year. Total dollar volume for properties sold rose 12.3 percent to $1.6 billion versus $1.4 billion a year earlier. Jones predicts that $60 to $70 per barrel oil prices will cause Houston’s job growth to slow significantly in the new year, with about 65,000 net new jobs created versus the nearly 123,000 jobs seen in the past 12 months. The Houston real estate market grew in all categories in November, with total property sales, total dollar volume and average and median pricing all up when compared to November 2013. Month-end pending sales for all property types totaled 3,404. That is up 4.0 percent compared to last year and suggests another possible increase when December’s sales numbers are crunched. Active listings, or the number of available properties, at the end of November was 27,374, down 9.8 percent from last year. Houston’s housing inventory slipped to a 2.7-months supply in November. One year earlier, it stood at a 2.9-months supply. According to the National Association of Realtors, the current supply of homes for the U.S stands at a 5.1-months supply. 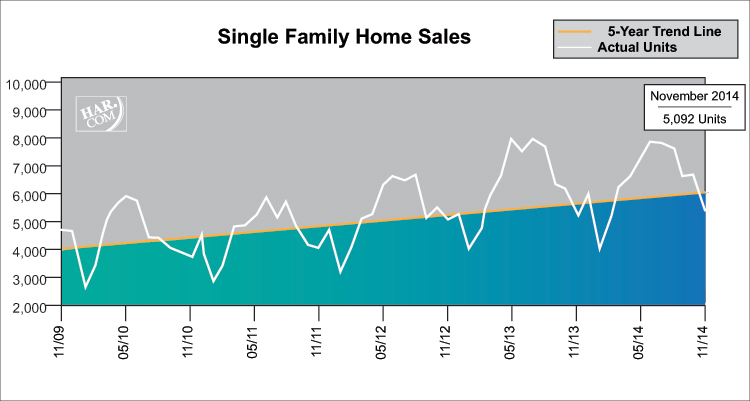 November single-family home sales totaled 5,092, up 1.8 percent from November 2013. Home prices reached record highs for a November in Houston. The single-family average price increased 10.3 percent from last year to $271,232 and the median price climbed 6.7 percent year-over-year to $194,800. The number of days it took a home took to sell¬, or Days on Market, was 54 versus 60 last November. In July 2014, it fell to an historic low of 45 days. .
HAR also breaks out the sales figures for existing single-family homes. In November, existing home sales totaled 4,361. That is up 6.3 percent from the same month last year. The average sales price shot up 11.7 percent year-over-year to $252,576 while the median sales price rose 6.6 percent to $180,000. Sales of townhouses and condominiums declined fractionally in November versus one year earlier. A total of 482 units sold last month compared to 487 properties in November 2013. 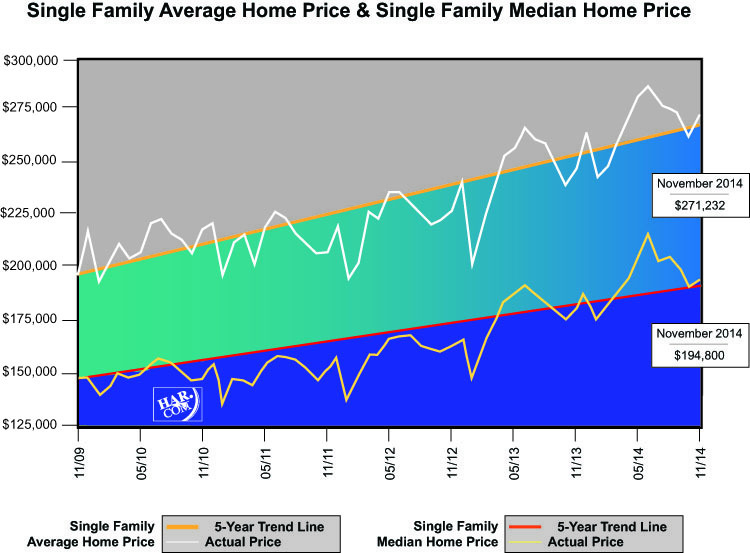 The average price was flat at $201,390 and the median price rose 8.6 percent to $152,000. Inventory reached a 2.4-months supply, which is down compared to the 2.8-months supply a year earlier. Demand for lease properties rose again in November, as inventory of for-sale properties shrank. Single-family home rentals climbed 4.2 percent compared to November 2013, while year-over-year townhouse/condominium rentals increased 5.7 percent. The average rent for a single-family home was up 5.0 percent to $1,669 and the average rent for a townhouse/condominium was up 3.6 percent to $1,520. Rentals of single-family homes rose 4.2 percent year-over-year and the cost of renting those homes increased 5.0 percent to $1,669. Townhouse/condominium rentals climbed 5.7 percent, with rents up 3.6 percent at $1,520. The computerized Multiple Listing Service of the Houston Association of REALTORS® includes residential properties and new homes listed by 29,000 REALTORS® throughout Harris, Fort Bend and Montgomery counties, as well as parts of Brazoria, Galveston, Waller and Wharton counties. Residential home sales statistics as well as listing information for more than 50,000 properties may be found on the Internet at http://www.har.com. OPEN HOUSE SATURDAY, AUGUST 16TH FROM 2PM TO 4PM! AMAZING HOME WITH A UNIQUE COMBINATION OF ELEGANCE & CARE-FREE COMFORT. THIS GORGEOUS CUSTOM HOME IS SECLUDED BEHIND A WOODED AREA. INCREDIBLE 2 STORY ENTRY WITH CURVED STAIRCASE. HARDWOODS & SLATE TILE FLOORS. FABULOUS ISLAND KITCHEN WITH BUILT-INS, BUTLERS PANTRY & PLENTY OF SPACE. INCREDIBLE MASTER SUITE & BATH. AWESOME THEATER ROOM WITH CUSTOM BUILT-INS. TONS OF FEATURES LIKE CROWN MOLDING, PLANTATION SHUTTERS, AUTO START FIREPLACE. OVER-SIZED 3 CAR + PORTE COCHERE, BALCONY OFF GAME ROOM. HIDDEN ROOM. YOU COULD SAY THIS HOME IS AN ESCAPE FROM THE ORDINARY! By Stephen Fishman, Friday, September 7, 2012. By Inman News, Wednesday, August 22, 2012. Sales of existing homes — resales of single-family homes, townhomes, condominiums and co-ops — were up 2.3 percent from June to July, to a seasonally adjusted annual rate of 4.47 million. That’s a 10.4 percent increase from a year ago. Yun said sales “could easily be much stronger” — in a more “normal” range of 5 million to 5.5 million per year — if not for “abnormal frictions” such as tight lending standards and shrinking inventory. Although the number of existing homes on the market was up 1.3 percent from June to July, to 2.4 million, that represents a 6.4-month supply of homes at July’s faster pace of sales, down from 6.5 months of supply in June. And looking back a year, listing inventories were down 23.8 percent, when there was a 9.3-month supply of existing homes for sale. Analysts generally consider a six-month supply of existing homes to be a healthy balance of supply and demand. More than that indicates that sellers significantly outnumber buyers, which puts downward pressure on prices. Although first-time buyers accounted for 34 percent of purchases in July, up from 32 percent in June, in a normal market they account for 40 percent of purchases, NAR said. Source: National Association of Realtors via Calculated Risk blog. By Inman News, Thursday, August 23, 2012. The report — which compares Zillow’s automated home valuation “Zestimates” for individual homes with actual mortgage loan balance data from TransUnion — showed all but one of the 30 largest markets tracked by Zillow saw a quarter-over-quarter improvement in their negative equity rate. Metro areas seeing the greatest quarter-to-quarter percentage point decreases in the negative equity rate were Phoenix (-3.9 percentage points, to 51.6 percent), Miami-Fort Lauderdale, Fla. (-2.7 percentage points, to 43.7 percent) and Las Vegas (-2.5 percentage points, to 68.5 percent). Among those 30 markets, only Philadelphia experienced an increase in its negative equity rate, which was up 0.4 percentage points from March to June. But the city’s 25.4 percent negative equity rate was still well below the national average. Charlotte, N.C. (-0.2 percentage point, to 36.4 percent) and St. Louis (-0.5 percentage point, to 30.2 percent) also failed to best the 0.5 percentage point improvement in the negative equity rate seen at the national level. Where are you? When you use popular geo-tracking apps, such as FourSquare and Glympse, I might know if you’re not home. Web sites such as http://www.pleaserobme.com help me keep track of your whereabouts.